Moscow is more than just Red Square and the Kremlin, as these unusual attractions reveal another side to the city. Russia tends to get a lot of bad press, but a visit to Moscow reveals a fascinating side to the country. Among the unusual attractions, we have a metro car turned into an art museum, the world's largest bell, Lenin's Mausoleum, a museum of Soviet-era arcade games and some iconic sculptures addressing the vices of man. Most metro cars are functional and boring. Moscow has changed that aspect by launching themed cars on the Sokolnicheskaya (Red) Line. One is an art gallery on wheels, decorated on the outside with a replica of a watercolour painting and inside they have removed certain seating to hang colourful art. 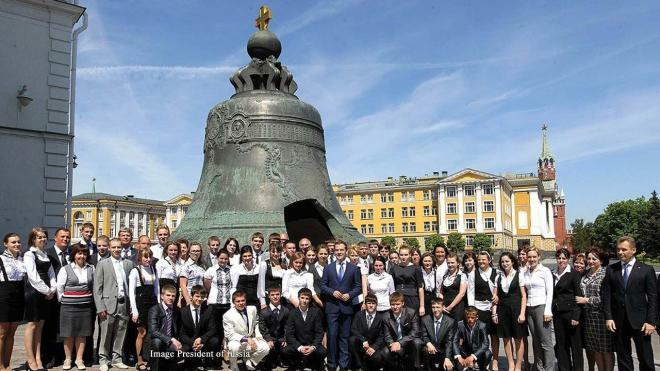 This is the largest bell in the world and can be seen standing in the grounds of the Kremlin in Moscow. The 11-ton bell was cast in 1735 for Empress Anna Ioanovna, Peter the Great’s niece, but has suffered a series of misfortunes. Two separate fires destroyed the derrick used to lift the bell from its cast. The second caused a portion of the bell to shatter. Today it can be seen in the Kremlin grounds, along with the broken piece. The students in the image give an idea of its massive size.